A clean room is a controlled work area that maintains a specified level of air particulates and other contaminants. Clean rooms are common in many industries, such as pharmaceuticals, medical device manufacturing, scientific research, chemical processing, and electronics manufacturing. 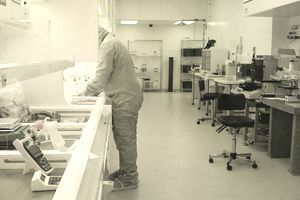 Clean room design requires careful consideration of its intended use, permissible particle concentration, location, manufacturing process, and cost. The design and specification of a clean room require close coordination between the design team and all of the departments or parties that will use the room. In the United States, Federal Standard 209E defines a clean room as a room in which the concentration of airborne particles is controlled to specified limits. The International Organization for Standardization (ISO) prescribes standards and requirements for clean room construction and operation. ISO 14644-4 specifies the requirements for the design and construction of the clean room facilities (to be referred to as clean room installations) but does not prescribe specific technological nor contractual means to meet the requirements. These are the elements that work together to create an effective contamination control room. HEPA (High Efficiency Particulate Air) filters: These filters are extremely important for maintaining contamination control. They filter particles as small as 0.3 microns with a 99.97 percent minimum particle-collective efficiency. The air in clean rooms typically is constantly circulated through HEPA filters to remove airborne contaminants and provide fresh air for the room's occupants. Clean room architecture: Clean rooms are designed to achieve and maintain an airflow in which the entire body of air within a confined area moves with uniform velocity along parallel flow lines. This airflow is called laminar flow. Airflow that is restricted causes turbulence, and turbulence can lead to particle movement. Maintaining laminar flow reduces the risk of airborne contaminants. Measurement and instrumentation: Some important measurements related to contamination control are particle count, airflow and air velocity, humidity, temperature, and surface cleanliness. Clean room managers usually have specific standards and/or instruments to measure these factors. Electrostatic discharge (ESD): When two surfaces rub together, an electrical charge can be created. Moving air creates a charge. People touching surfaces or walking across the floor can create a turbo-electric charge. Special care is taken to use ESD protective materials to prevent damage from ESD. Cleaning managers should work with their personnel to understand where these conditions may be present and how to prevent them. Ventilation and makeup air: Ventilation and makeup air volumes are dictated by the amount required to maintain indoor air quality, replace process exhaust, and maintain building pressurization. Ventilation is air exchange, or replacing old air with fresh filtered air. Makeup air is the fresh air that replaces the air that is exhausted from the room during ventilation. Pressurization: Rooms in a clean facility should be maintained at static pressures higher than atmospheric to prevent infiltration by wind. The only exception to using a positive differential pressure is when dealing with specific hazardous materials where governmental agencies require the room to be at a negative pressure. Temperature and humidity: Temperature control is required to provide stable conditions for materials, instruments, and personnel comfort. Humidity control is necessary to prevent corrosion and condensation on work surfaces, to eliminate static electricity, and to ensure a comfortable work environment.